"Iran has been accused of altering an image of a missile test, possibly to exaggerate its military capabilities. 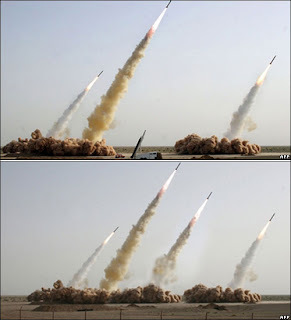 Four missiles appear to take off from a desert launch pad in one image of the test published on the Iranian Revolutionary Guards website. But a similar image has emerged that shows one missile still in its launcher after apparently failing to fire. Analysts said that in the image apparently showing four missiles taking off, one of the projectiles was added using elements from the smoke trail and dust clouds from two of the other successfully launched missiles. The image said to have been digitally altered was disseminated by the AFP news agency and reproduced by media organisations around the world - including the BBC News website, which removed it from pages when doubts about its authenticity were raised. " 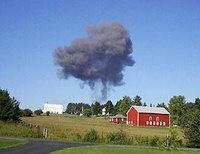 Remember that Ms. Leverknight said about Val McClatchey's photo in a phone call from Jeff Hill that the original photo didn't have a mushroom cloud in it which means someone added one in. It's ridiculous that so many are making such a big deal out of this photoshop issue. What about the three that launched successfully? What about the others that Iran alledgedly possesses? We should leave Iran an honorable path of retreat. Engaging Iran in the global economy is the only approach that has merit. Regardless of Iran's size however, we should be careful what we assume about Iran; it has some ten million men of military age. Puor bien savoir les choses, il en faut savoir le detail, et comme il est presque infini, nos connaissances sont toujours superficielles et imparfaites. Unfortunately, what we do know is that the Bush administration cannot be trusted to do what it says. Iraq taught us that lesson. Many experts have long been predicting that Bush would invade Iran before he leaves office. But of course, the Bush administration would never admit to such a thing. But it is the man who follows his own counsel, he’s the one that should lead. Now who and why would they do that?